It’s no surprise that this one top the poll, Eric. This one is still resounding 30 years later (and why I noted my first time with it last year). Still, lot of great films by John Carpenter represented. You going to see ‘Halloween’ re-issue on the big screen this month? Oh cool, didn’t know you did a TMT on this. Thanks for sharing, Michael! I’m working on a couple for a pair of films traditional to that holiday upcoming. Thanks. Great, looking forward to reading them, my friend! Hard to argue with the results of the Carpenter poll. Although I’m surprised to see anything but Halloween and The Thing scoring votes… those two are far above his other offerings, I think. Well, to be fair, the poll was for *favorite* John Carpenter, not *best*. But yeah, those can oftentimes mean the same thing. It really doesn’t get much better than either of those films. I’m saddened that Big Trouble in Little China (my pick) didn’t take the top prize, but I can’t argue too strongly against the results. The best choices are all near the top. I picked up Out of the Park baseball a few months back, and I’ve struggled to stick with it. I’m guessing that a league like the one you joined is the way to make it a lot more interesting. Competing against the computer just wasn’t that much fun. I hear ya, Dan. I felt the same way about They Live, but it’s hard to compete with the two all-time horror greats of The Thing and Halloween. Bummer to hear you didn’t get into OOTP. I have spent way more time with that sim than I would like to admit. 😀 Playing in a league with others does add a whole new dimension, though. Come to think of it, there may be a new opening for the Laundry League. I’ll have to double-check to make sure the spot hasn’t been filled, but is it something you might be interested in joining? Hi Eric. I might actually be interested in joining. It sounds like you already had the draft, right?. Let me know if it’s still possible and if you have more details. Hey Dan, it sounds like there are still two openings available. I went ahead and sent you an email to the address on your blog — let me know if you got it. Thanks! I’m afraid I can’t judge by the whole franchise — I think the only one I’ve seen more than one film in is Friday the 13th, and I’ve only seen the first two there. Just by what I’ve seen, Halloween takes it. 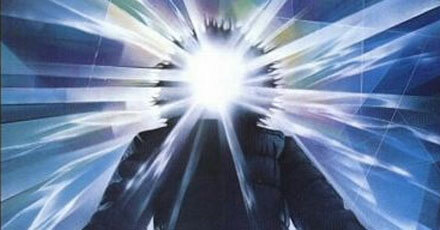 I love Carpenter’s version of The Thing. This is one of my favourite movies. Everything is pitch perfect, the effects are amazing, and the ending is brilliant. Absolutely, Paul. I actually just saw it for the first time last year, and I was impressed with how well it held up. Not dated at all. I’m at a disadvantage for next poll, lots I haven’t seen, maybe I should set a goal of seeing the first installment of all those franchises…I like Nightmare on Elm Street, granted many misfires in series, but also worthy sequels like New Nightmare (1994), or Dream Warriors (1987). Oh yeah, I’m starting to get into the horror mood this month! 😀 I have a batch of mini-reviews ready to post tomorrow, and I have a few more ideas in the pipeline for the coming weeks. How about you? Got anything else planned after The Cabinet of Dr. Caligari? If there’s time, maybe Chidren of The Corn, Night of the Living Dead, Friday the 13th, and Hellraiser, none of which I’ve seen. Night of the Living Dead is a must see. Outside of some ill-advised character antics, it holds up surprisingly well today. I still need to see Children of the Corn myself. Might give that a go, too, especially since it is on Netflix Instant now. Glad to see I’m not the only one who considers The Thing his best. You’re not alone at all on that one, Dave. I think The Thing had the lead pretty much the entire week. I would have been shocked if The Thing didn’t rock this poll. Awesome horror film. Voted for Saw this week. Sure, it’s all gone a bit weird and overly violent, but I really dig Jigsaw as the killer. He’s like Dexter totally on the loose. Hey, you’ll get no complaints from me about your Saw vote, Jaina. I’m a big fan of the series, even though the last two or three were pretty bad. Jigsaw is a great villain for sure. Yeah, totally agree with the poll results. Love The Thing and it is easily my favourite. It’s all about Assault on Precinct 13 for me. Love the new poll. Went for serial killers but its a damn tricky question. LOVE Assault on Precinct 13. One of Carpenter’s best, no doubt. Missed the boat on this one, but I’d have given it to The Thing as well. In fact, the top three results are precisely what I’d have as my personal three favorite Carpenter films. Sometimes, a guy’s opinion just reflects that of the zeitgeist. Hi Andrew, thanks for stopping by! Yeah, I can’t really argue with the top three results here, even though They Live is my personal favorite. Carpenter was on fire for a good chunk of the 70s and 80s.